Yes, it’s another blue Audi, and whilst this one might not have lasers for headlights it does pack a whole host of other cool stuff. 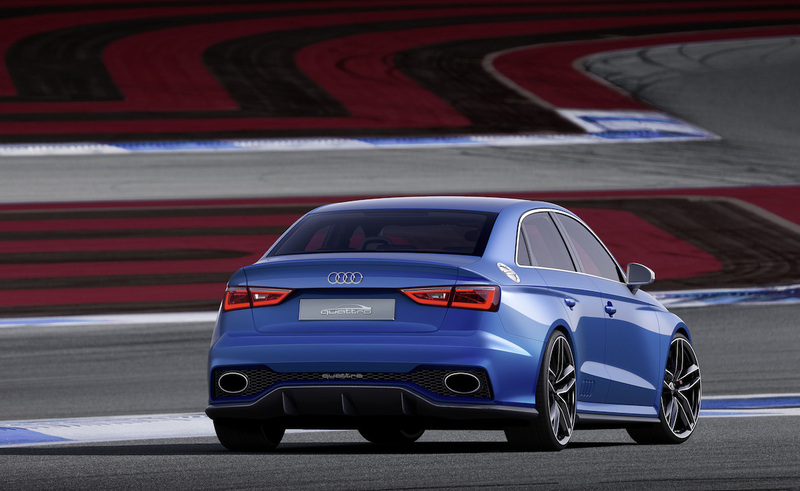 Not least a 518 bhp engine and a air-brake that works to cut stopping distances; on a compact saloon! 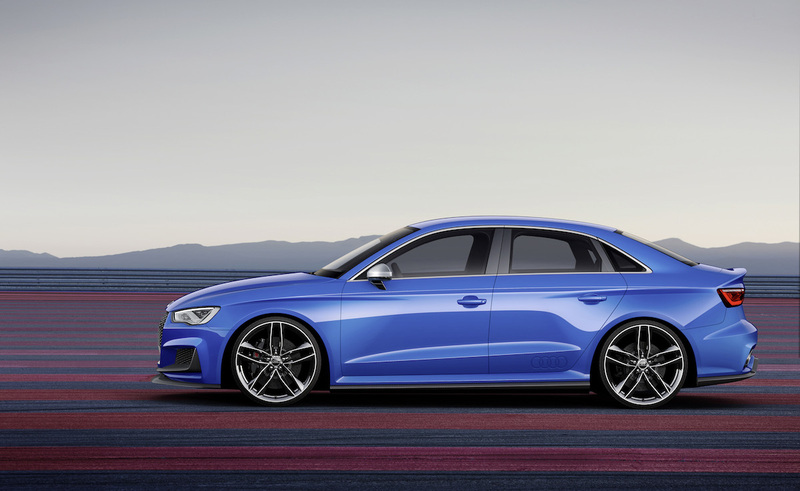 Audi’s A3 and S3 saloon offerings have only been around for a little while. However, that hasn’t stopped the Ingolstadt firm deciding to use the smallest four-door as the basis for one of its concept cars to show off at the Wörthersee event this year. Making a welcome appearance is the 2.5 litre five-cylinder engine; previously seen in the last generation RS3 and currently doing service in the RS TT and RS Q3 models. 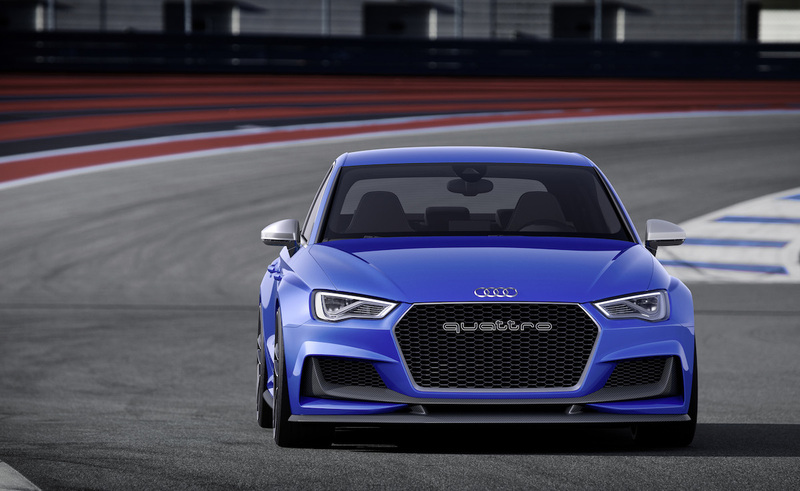 In the quattro clubsport, output is upped to a wondrous 518 bhp (525PS) matched by an equally awesome 443 lb-ft of torque. The result is 0-62 mph in 3.6 seconds, and a top speed of 192 mph! Big numbers for a baby sedan. All this is made possible through the use of a bigger turbocharger, enlarged intercooler and ECU tweaking. Adjustable coilover suspension drops the clubsport quattro 10mm lower to the ground, and allows for the setup to be tailored to road or track. 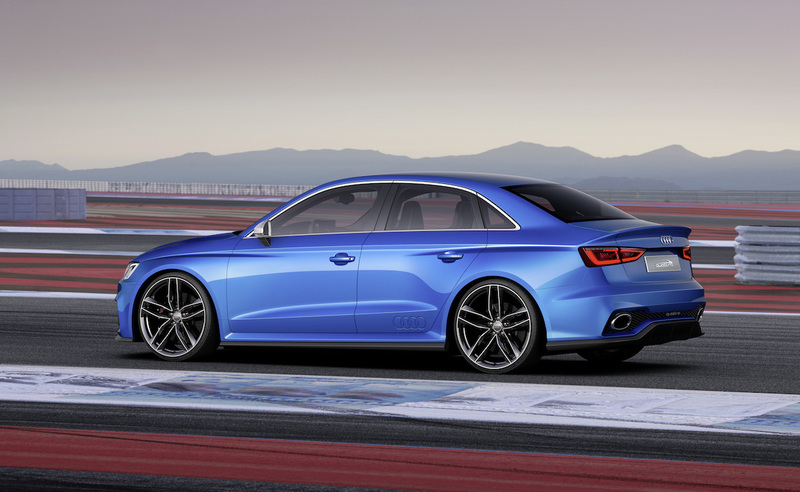 Huge 21″ wheels, with ultra-low profile 275/25 tyres, emphasise their massive proportions on the A3 Saloon’s compact bodyshell. Carbon ceramic brakes, 370mm in size up front, combined with the air-brake mounted in the rear spoiler ensure the clubsport quattro stops as well as it goes. In fact, Audi claims that, at 155 mph, the addition of the air-brake cuts stopping distances by 12 metres. It’s also just rather cool, we think. The seven-speed S tronic DSG gearbox features ‘Launch Control’ to ensure maximum acceleration from the off, and connects to a specially designed hydraulic quattro system that shifts power to the rear axle to kill understeer when cornering. Dynamic torque vectoring, from the Electronic Stability Control, also helps the Audi A3 clubsport quattro turn in tighter and maximise adjustability by braking individual wheels as necessary. This concept should, therefore, handle just as well as it looks and goes. In terms of exterior styling, it’s hard to escape the attention grabbing giant front grille surrounded in matt aluminium and bearing a big ‘quattro’ logo. The carbon fibre ‘wing’ below it, along with the jutting splitter and gaping air vents give the rest of the front end some serious aggression. We’ll add that the Magnetic Blue paintwork reminds us heavily of the Sprint Blue found on the B7 RS 4. At the sides the carbon fibre continues with the prominent side sills, but it’s those squared off wheel arches that are a pure classic quattro styling feature. Aluminium trim features on the fuel-filler cap and, of course, on the wing mirrors; it wouldn’t be a hot Audi without them. Out back there is the immediately obvious carbon fibre diffuser which kicks up towards the boot. Honeycomb mesh surrounds the giant oval exhaust pipes with another ‘quattro’ badge added for good measure. The rear spoiler is positively anonymous in comparison but it does house the aforementioned air-brake. Inside is slightly more normal save for the addition of bucket seats, a steering wheels suspiciously like the one seen in the Sport quattro concept, and a wealth of special ‘clubsport quattro’ badges. More pertinent is the shift light which reminds you, or the DSG ‘box, to shift up at the 6,900 rpm redline and the engine start button on the steering wheel itself. Much like Volkswagen’s Golf R 400, it is easy to dismiss the A3 clubsport as just another show car. Audi has teased us a lot lately with various different concepts, but only as technological showcases rather than serious production suggestions. Given how much an A3 with such performance would upset the established Audi model hierarchy, it would seem unlikely we’ll ever see this exact car on the street. 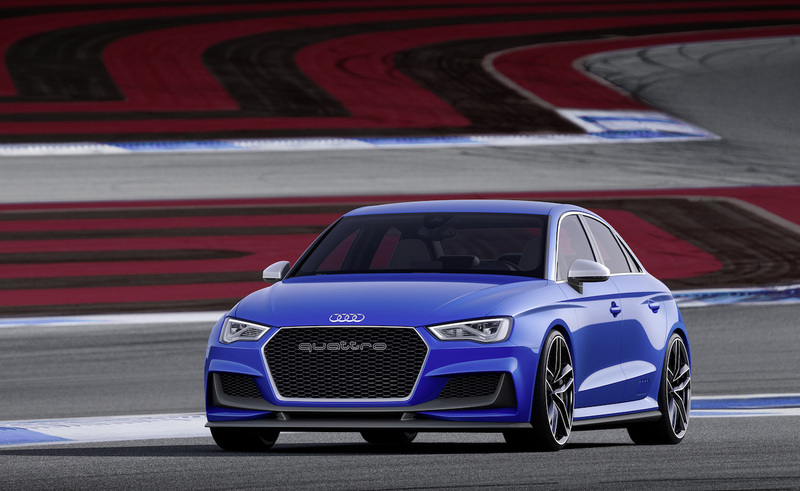 But it does bode well for the potential of the next RS3 at least. Whatever happens, it’s still cool and we still love the idea of it. Should you want to see it in the flesh, you’ll need to head to the Wörthersee meeting in Reifnitz, Germany at the end of the month. 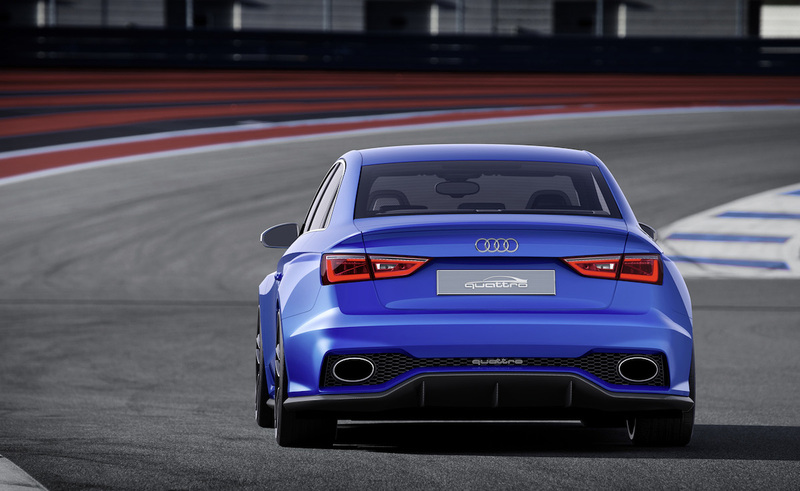 The A3 clubsport will be on display along with a whole host of regular production Audi models. Next Post Editorial – Have you got fuel economy OCD?